A Modest Proposal: How about an Irish Road Running League? When it comes to races, it’s possible to have too much of a good thing – and that is our problem at the moment. Because every race must be insured, cluttering up official calendars are small local races and leagues, GAA runs, charity walks/runs, commercially run races, and various novelty events. Sifting though such lists to find the genuine, club-organised races can be exhausting and bewildering – and that’s for people who know what they’re looking for. Many wonder why GAA, rugby, rowing and others clubs organise fund-raising runs. In athletics, we don’t put on fundraising football matches – and if we did, the GAA would object strenuously. So goes the argument; correct up to a point, but ignoring the fundamental appeal of running. Every sport involves some level of running, whether in the sport itself or as training. GAA players run as part of their fitness routine. So do table tennis players, canoeists, volleyballers badminton players and rowers. And so on. Snooker players run – most notably Ronnie O’Sullivan and our own Fergal O’Brien. Darts players? Maybe not! That’s the reason athletics is often cited as everyone’s second favourite sport and why it remains fundamental to the success of the Olympic Games. We have to accept that anyone is perfectly entitled to organise a road race and that some do a pretty good job of it. If athletics organisations make extra income providing them with insurance and licenses, then why not? However there is a strong argument for leaving such events off our road racing calendars, or at the every least putting them on a separate list. They are not aimed at us after all. In Irish triathlon, the essential races of the year are organised into a league, with points awarded for placings in all of them. The dates are known well before the start of any new season. Could we do this in athletics? It shouldn’t be that hard – we all have a good idea of when annual must-dos such as the Raheny 5, Ballycotton 10 and Dublin Marathon take place anyway. Races to be considered for such a league should include senior, masters (M/W35-85), juniors (where appropriate) and team categories, with points at stake. Ideally, the races would be organised by Athletics Ireland/ANI-registered clubs, with a few exceptions. Some of the many excellent BHAA races for instance scream out to be included, and it could be done – the Dublin Marathon happily includes team categories both for clubs and BHAA teams, while the Cork to Cobh “15” is one of the top races in the country. Commercial races? H’mmm – both the national 10k and the national half marathon are currently organised in conjunction with internationally franchised events, which pay AI a fat fee for the privilege. This is not an ideal situation, not to mention something of an insult to the many excellent races run by local clubs. The women’s mini marathon? Over 2,000 registered club runners turn out in it every year proudly wearing their vests. If a club category was added to the race, it could be included. 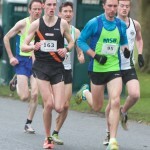 National Road Relays? Team categories only; no problem. We’ve also added the Autumn Open Cross-Country for some variety because it’s open to all. Now for the list. For this, we have consulted interested parties from Ireland south, west and North; special thanks to John Walshe, Malcolm McCausland, Ryan Maxwell and John Hunt for their ideas. Because not every race in the country has fixed its date for 2016, the list is far from complete. But with luck, it will provide some kind of framework. Additions and suggestions welcome. Michael Egan Memorial 5-Mile, Quilty, Co Clare. Ballycotton 10, 1.30. Organised East Cork AC and local community. Entry closed. Tubbercurry St Patrick’s Day 10k, Co Mayo. Dunboyne 4-Mile, 3pm. Organised by Dunboyne AC. Sonny Murphy Memorial 10-Mile, Kilnaboy, Co Clare. Patsy Kelly 5km, Ecco Rd, Dundalk. Terenure 5 Mile, Dublin. www. terenure5mile.com/. Bob Heffernan 5k, Johnstown Bridge, Enfield. Enniscorthy Strawberry Half Marathon, 10am. VHI Women’s Mini Marathon 10km. Mid-Summer’s Day 5km, St Anne’s Park, Raheny. Waterford Viking Marathon, Half Marathon, Quarter Marathon. SSE Airtricity Dublin Race Series 2: Fingal 10km, Swords. tbc Streets of Galway 8k.www.galwaycityharriers. tbc ‘Route2Crook’ Goleen to Crookhaven 5-Mile. tbc Rockford Rood Tile Tinryand 4-Mile, Carlow. 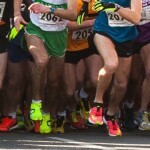 Longford Marathon, Half Marathon. www.longfordmarathon.com. Rennicks Cup 5 mile, Bohermeen, Co Meath. C: 086 0792580. 51st Hollymount Road Races, Co Mayo.